(Starlord#1 (fb) - BTS) - Bovric was a "distant, insignificant" colony world within the Carinian Cluster. (Starlord#1 (fb) -BTS) - Three Probiti were stationed on Bovric. (Starlord#2 (fb)) - Ship, and presumably Star-Lord, were caught in the pull of a black hole. Ship narrowly escaped destruction by "slingshotting" around the gravity well, but she crashed on the planet Bovric. (Starlord#1 (fb) - BTS) - One of the Probiti died in a seeming accident; though unproven, it was suspected that Lawgiver Harith Damyish had caused the death. (Starlord#1 (fb) - BTS) - Four months later, Sinjin Quarrel, a Probiti of very limited power, was assigned to replace the fallen Probiti. 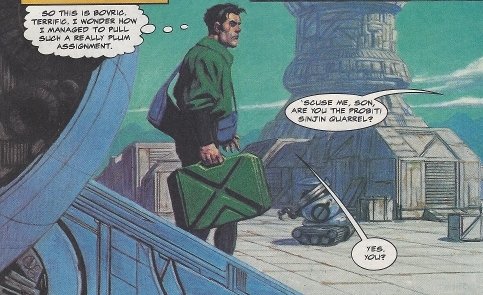 (Starlord#1) - Sinjin Quarrel arrived on Bovric and was met by Newlin, who was pleased to have a new Probiti and was there to give him a ride to Paka's Crossing. 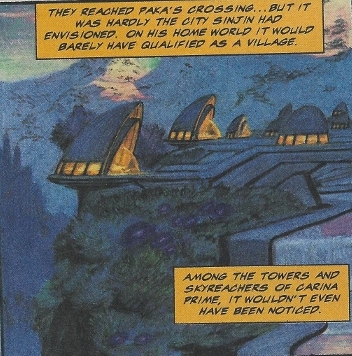 Newlin took Quarrel's bags, loaded them into his "hover" <craft>, and then took him to Paka's Crossing; en route, they passed by the private estate of Lawgiver Damyish. Newlin noted Damyish to be a powerful man with a strong dislike for Probiti, and then further shared the common belief that Damyish had been behind the death of Quarrel's Probiti predecessor, urging Quarrel to watch himself. They soon reached Paka's Crossing, though Sinjin was disappointed in the small village, fearing he could never make his parents proud. That evening, Sinjin awakened from his dreams to find himself in the middle of the forest, subconsciously summoned there by the telepathic Ship; after using his Omnic's Lostproof function (see comments), he found Ship and learned her story. Needing to get to work, he left at dawn, but promised to come back again after work. For the next week, Sinjin spent his days at the Justice Center, probing into the thoughts of defendants, plaintiffs, and witnesses, and spent his nights with 'Rora (as he had named Ship), helping restore her damaged mind. In the days off, he caught up on much-needed sleep and made a few discreet inquiries, such as checking whether Newlin had any further information on Star-Lord, which he didn't. Sinjin further asked Newlin to borrow a portable diagnostic. Newlin let him borrow an old Prampton multi-read he wasn't using, but when he asked what it was for, Sinjin merely told him he wasn't ready to reveal his secret yet. An hour later, Lawgiver Damyish met with Colonel Castonis, who brought the latest batch of purchase orders, noting that Damyish now owned everything in the Green Ridge Valley now, right up to the edge of the Starkiln property. Damyish further noted that once Starkiln announced the new assembly plant they would be building out there, the surrounding land values should increase 1000%. Castonis then noted his research on the new Probiti, noting his midnight strolls through the forest, his virtuous past history, and his most recent meeting with Newlin. (Starlord#1 - BTS) - Damyith and Castonis met with Newlin, who apparently told them that Sinjin was asking questions about Star-Lord (see comments). Hours later, Damyith and Castonis' skimmer passed over and then located 'Rora, after which they landed and investigated on foot. (Starlord#1) - As Sinjin was heading home for the night, 'Rora summoned him back, noting her apparent discovery. Castonis discovered the widget 'Rora was using to monitor their progress and shot it out of the air; they put it in the skimmer. When Damyish and Castonis boarded 'Rora, Sinjin donned Star-Lord's uniform and used his element gun to drive the pair off. As Damyish and Castonis returned to Damyish's estate and took the widget to the Jamhook (Carinian for "blackmail") vault for protection so they could study it further, 'Rora lifted off despite her limited power, but she was forced to flee from his defenses (lasers and missiles). Still monitoring Damyish, they heard about his plans to blackmail General Viz Glazgon (head of the Iforani mercenary group) to take care of "Star-Lord," (and to make plans to blackmail to others as back-up), as well as to have Mastertech Belvedere gain everything he could from the widget; 'Rora realized that if they unlocked the widget's secrets, there would be no stopping Damyish. (Starlord#2) - After hearing (via Ship's monitors) Damyish instruct Castonis to pick up, detain, imprison, and/or slay Quarrel for his presumptive involvement, Sinjin made a plan to prevent Damyish from discovering the widget's secrets. 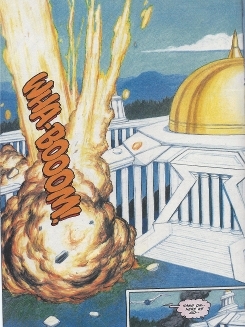 Using Star-Lord's element gun, Sinjin formed an immense meteroid out of rocks and ice (unwittingly destabilizing a volcano on R'Ralmis, the gun's source), which 'Rora used a pair of gravifex beams to cause to crash into Damyish's estate; in the immediately ensuing chaos, 'Rora swept in and recovered the widget and then escaped. After 'Rora then explained that Sinjin that he could not return to Bovric after his recent encounters/activities, Sinjin agreed to adopt the identity of Starlord, at least until they could find Peter Quill, and they headed off to R'Ralmis to review records on Quill/Star-Lord. They correctly reasoned that Damyish was headed to the base of General Viz Glazgon and the Iforani on Holmrig as his next step in trying to take over the entire Carinian Cluster; and they headed there to stop Damyish. Given Damyish's ruthless and scofflaw nature, I fear he may have had Castonis torture Newlin for information and/or possibly kill him afterwards: we never saw nor heard about Newlin after that meeting. Newlin deserves his own profile. Any takers? Mastertech Belvedere was an agent of Damyish with significant expertise in technology. Having captured a one of 'Rora's widgets, Damyish instructed Colonel Castonis to have Mastertech Belvedere gain everything he could from the widget..
(Starlord#1 (fb) - BTS) - Upon learning of a new assembly plant to be built on the Starkiln property, Damyish purchased all remaining property in the Green Ridge Valley, right up to the edge of the Starkiln property. He realized that once Starkiln announced the new assembly plant they would be building out there, the surrounding land values should increase 1000%. (Starlord#1 - BTS) - Colonel Castonis brought Damyish the latest batch of purchase orders, confirming he now owned everything in the Green Ridge Valley, and the two review the significance of this. 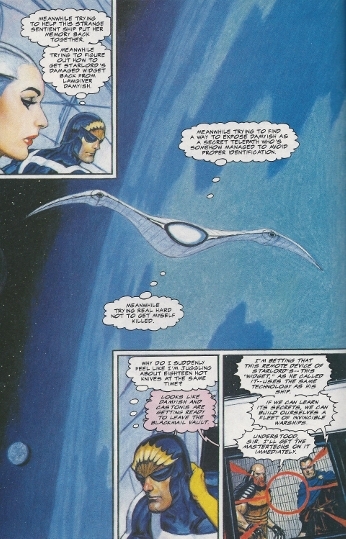 Justice Centers held trials during which the Probiti stationed in the region used his or her telepathic power to probe the thoughts of defendant and plaintiff witnesses. After the Probiti stationed in Paka's Crossing perished (believed by many to have had his death arranged by Lawgiver Damyish), Sinjin Quarrel was stationed in Paka's Crossing as his or her replacement. Up until his departure with Ship/'Rora, Sinjin spent his days doing his duties in such trials. 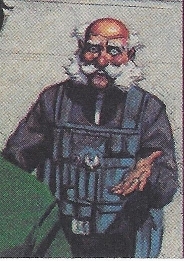 A spaceport mechanic (presumably in Paka's Crossing), he considered Lawgiver Harith Damyish to be a ruthless little snake who thought he owned the planet, and he urged Quarrel to watch himself. Damyith considered Newlin a "small-minded man," and also new Newlin considered him a ruthless snake. 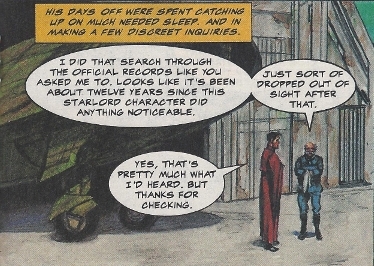 After meeting Ship/'Rora, Sinjin checked whether Newlin had any further information on Star-Lord, which he didn't. Sinjin further asked Newlin to borrow a portable diagnostic. Newlin let him borrow an old Prampton multi-read he wasn't using, but when he asked what it was for, Sinjin merely told him he wasn't ready to reveal his secret yet. Castonis then noted his research on the new Probiti, noting his midnight strolls through the forest, his virtuous past history, and his most recent meeting with Newlin. The town/village/city in which Sinjin Quarrel was stationed four months after the previous Probiti died (largely believed to have been due to the actions of Lawgiver Harith Damyish). The town had a Justice Center in which Quarrel worked, and was also nearby a forested region, in which 'Rora/Ship had crashed many years before. Presumably, following Sinjin Quarrel's departure, another of the Probiti was stationed there to replace him. Newlin lent Sinjin an old version of one of these portable diagnostic devices despite Sinjin not revealing what he needed it for. Sinjin used it to help repair the damaged Ship/'Rora. Starkiln was apparently a relatively wealthy industrialist who planned to build an assembly plant on his property.